The TITREX Digital Burettes offer a fast, sensitive and easily adjusted variable titration, and are less costly than motor burettes. 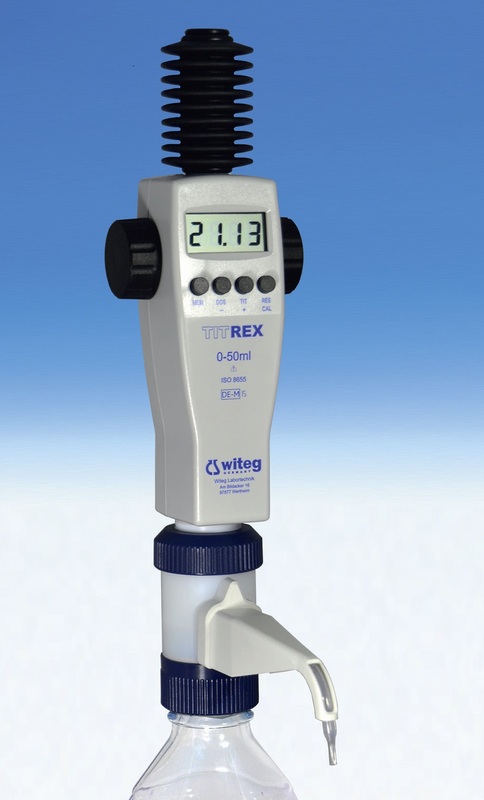 The digital burette TITREX is ideal for a fast and sensitive titration “drop by drop”. One instrument simulates all volumes up to 99.99 mL. Moreover, titration is possible without any loss of reagent! From air-purging, necessary for a precise titration, to disassembly of the burette in the end of the titration – the reagent, that is not needed for the titration flows back into the bottle! TITREX‘s accuracy and precision are of highest quality. Its error ranges are better than those required by ISO 8655. 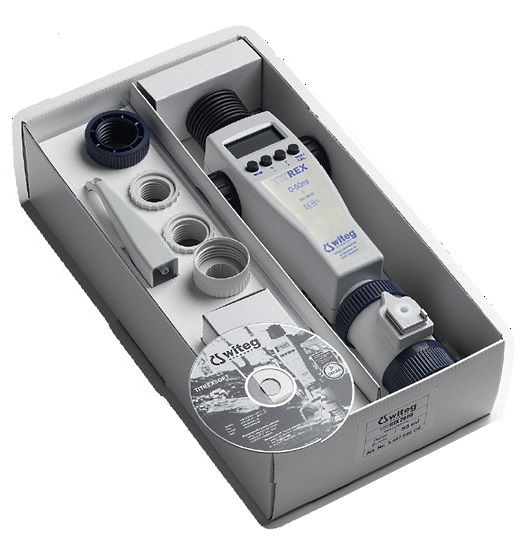 The memory function allows saving of up to 1000 values, which can be transferred to a PC and read using the software which is included in the standard supply. The dosing speed is adjusted when turning the hand wheels without steps from fast to drop by drop. The TITREX Digital Burettes have the advantage that the piston only, without head weight, is moving during the titrating process and few turnings on the wheel are sufficient to take the preselected volume. The TITREX Digital Burettes have a safe and secure rest position. By turning the operation mode selector by 180° all liquid in the discharge tube flows back into the bottle. It is almost impossible for any leakage to occur when it is in that position. The TITREX is completely shut down and no accidental discharge will occur by inadvertently moving the piston. This is clearly indicated by the position of the tube and the setting of the operation mode. 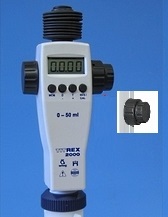 Two versions are available, the TITREX Digital Burette Standard and the TITREX Digital Burette Fine Adjustment. The Fine Adjustment has an additional knob for more precise control.